as it draws breath against the unknown. I've used this quote before, but I love it so much I could use it a million times more and not be tired of it. One may think as a birth photographer, that photographing the baby and the baby's arrival is the highlight. It's certainly a moving experience and one I hope everyone is able to witness, because it is truly a miracle and watching it unfold is transformative. Every. Single. Time. But it isn't my favorite part. I love to capture the connection between partners the most. The teamwork, the love, the compassion, and the mutual joy for what they've created together. 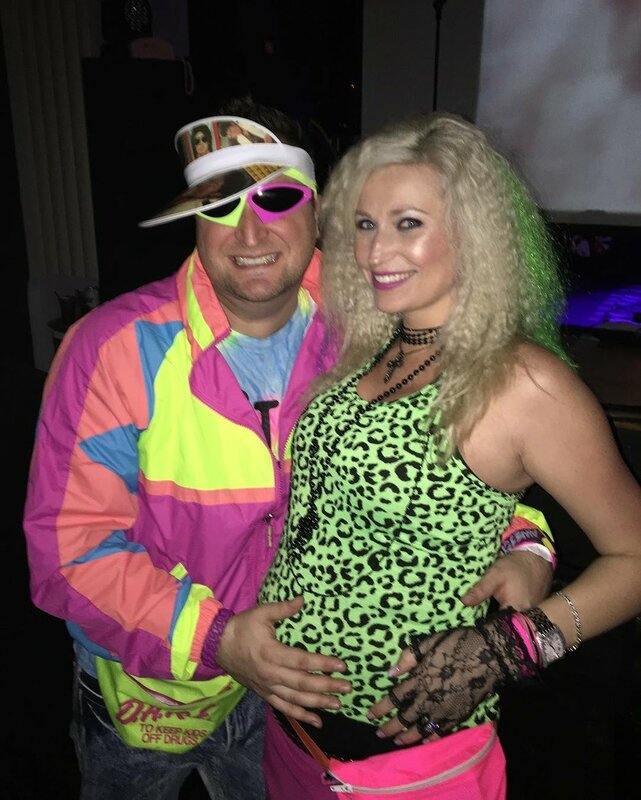 Our friends Laura and Rob announced they were pregnant at our college homecoming last fall. 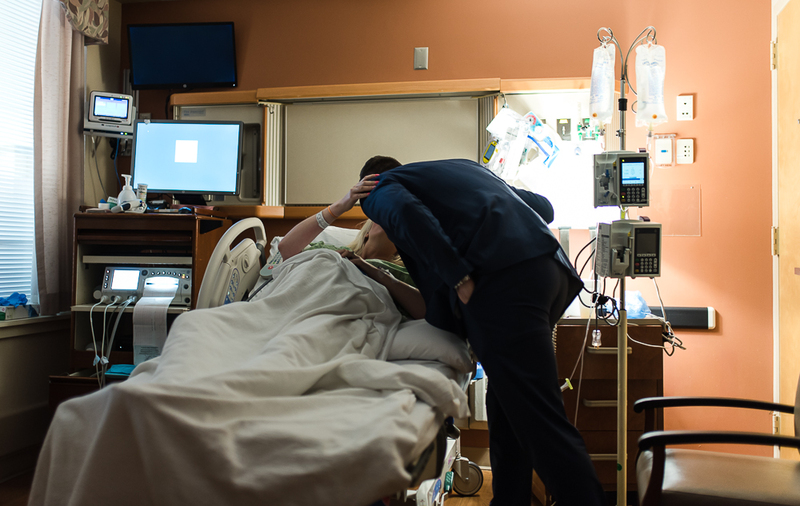 The first thing I did was offer my congratulations, of course, but immediately I was hoping and praying they'd ask me to photograph the birth of their baby. Don't get me wrong, I want ALL the births, but I just knew that theirs would be an extra special one. For those that don't know them, they're extra special people. Case in point. They're uniquely themselves and aren't afraid to show it, and I love their unabashed love for one another. So when Laura contact me a few months later to talk about birth photography, I was thrilled. As with many first babies, Laura went past her estimated due date and we were one day shy of 41 weeks waiting (sort of) patiently. She went to her routine check-in and learned she was actually in the beginning stages of labor and was to head straight over to St. Joe's to be admitted. Things were progressing well and she reached a point where she needed some relief. After the epidural was administered, there were laughs and fun, but also a lot of anxieties. Rob (dad) was so concerned for Laura's well-being the entire time and didn't leave her side for a single second. He may have broken a record with questions for the nurses and also of asking his wife how she was feeling. It was so heart-warming to witness. You could actually feel his emotions and he was feeling a wide range of them. 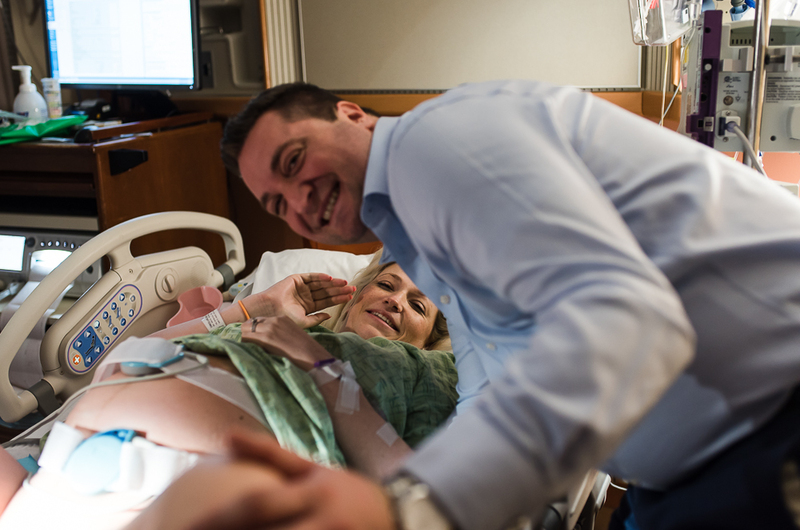 Once they learned that she had fully dilated, the doctor joined us and everyone was prepped for delivery. Assuming, as most would, it would be awhile for a first baby to descend and make his/her way earth side. Laura and Rob decided not to find out the baby's gender, so there was also a great anticipation to see what she'd been carrying for the past 10 months. Sadly, Rob's father had passed a short time ago, and while Rob said he didn't care if it was a boy or girl -- it was obvious to me that a boy would mean a lot to him. A way to remember and honor his late father, with whom he was very close. Remarkably, Laura pushed for only 20 or so minutes, which was a record for me to witness for a first time mom. And their baby boy was born. The photographs of Rob realizing he now had a son are some of my favorite images captured to date. 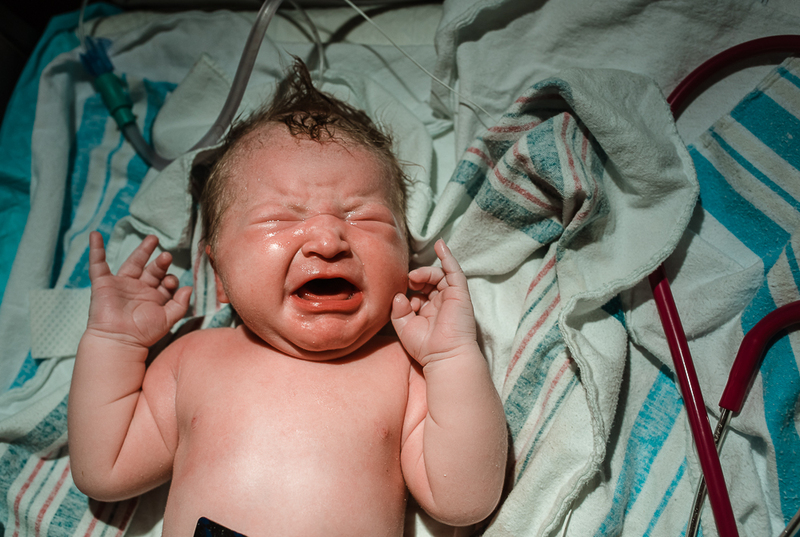 There was meconium stained fluid so Laura didn't get immediate skin to skin right way, but that gave her and her husband a few minutes alone to soak in the fact that they done it. She was amazing and worked so hard, and their baby boy, Robert III had arrived at last. Named, of course, after his Daddy and his late grandfather. Baby Robert was born on April 26, 2018 and weighed a whopping 9 pounds 4 ounces. He was placed in his mama's arms just a few minutes after birth and Laura and Rob became parents. It was an honor to capture this for them, and I'm sure these photos will be looked back on and treasured forever.